Metro bike patrol, a photo by uno000 on Flickr. 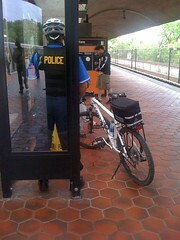 A rare sight, metro police has a bike patrol. Hopefully we'll see more of them on the trains and around Metro stations.